Amongst the many parks in Nanning city, few boast the number of strange and wonderful attractions that People’s Park has. From the bizarrely placed cannon on its slope to the small garden that rests on the surface of the White Dragon Lake, this park features a variety of scenic spots that will appeal to historians, naturalists, and those who simply want a fun day out. 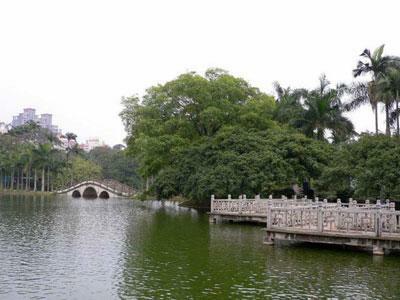 The park was established in 1951 and is located in downtown Nanning, so it’s within easy reach if you’re planning a trip to the city. The People’s Park in Nanning is not to be confused with many of the other “People’s Parks” across China. The term “People’s” Park, or Renmin Park, was popularised in 1949 to express the solidarity and importance of the people during the rise of Communism in China. These parks still stand as a testament to the unity and strength of the Chinese people. As you enter the gate of the park, you’ll immediately come upon the Wangxian Slope. “Wangxian” literally means “to gaze at immortals” in Chinese and this strange, ethereal hillside, with its thick forest and 10-metre-wide stone steps, is so-called because it directly faces Qingxiu Mountain. Supposedly, if you look out towards the mountain, you may catch sight of Luo Xiu, a scholar from the Jin Dynasty (265-420) who achieved immortality through the practice of Taoist alchemy. We’re not quite sure what he does all day but, if you see him, be sure to give him a polite nod and a wave. The 141 stone steps leading up the slope symbolise the 91 enterprises that were built after the liberation of China in 1949 and the 50 programs that were settled in 1950. As you ascend the slope, you’ll soon catch sight of the Zhenning Cannon. Originally this site was once an ancestral temple dedicated to six historical figures who had each contributed to the development of Nanning. This temple was built during the Northern Song Dynasty (960-1127) but was tragically dismantled in 1917 by the warlord Lu Rongting and replaced with a huge cannon. This cannon was made in 1890 by Krupp of Germany and has a firing range of 12,000 meters, although we hope that no one plans to test it again anytime soon. Alongside this cannon, you’ll also find battlements, barracks and forts, which seem rather out of place in this peaceful city park. Yet Lu Rongting’s army weren’t the first to settle in this seemingly idyllic place. According to historical texts from the Southern Song Dynasty, when General Di Qing (1008–1057) went to Guangxi to suppress a rebellion that was happening in the region, he stationed his troops in modern-day People’s Park. When he looked down from Wanxiang Slope, he noticed a strange white figure floating on the surface of the lake. He stared at it long and hard, until a colleague pointed out that it was simply the reflection of a flock of sheep drinking on the bank! The General named it White Dragon Lake, after the shape of the sheep’s reflection. Nowadays there are no dragons, or sheep, hiding in the lake, but there are over 100,000 multi-coloured koi carp in its waters and beautifully carved bridges connecting its many islands and banks. On a warm sunny day, you can take a stroll along the bridges, feed the fish or take a paddleboat out onto the shimmering waters. In keeping with the military aesthetic, there is also the Revolutionary Martyrs Monument on the northeast section of Wangxian Slope. This moving tribute to the revolutionists who lost their lives during the Great Revolution (1924-1927), the Anti-Japanese War (1937-1945) and the Liberation War (1947-1949) is a spot of reverence for many Chinese people and is decked out in flowers during the Tomb Sweeping Festival. However, if you’re not historically inclined, we recommend a visit to the park’s Botanical Garden, where you can feast your eyes on a selection of over 80,000 plants. The garden contains many rare flowers, including numerous types of orchid, a 1,000-year-old banyan tree, and the largest ball cactus in Guangxi. At over 52 centimetres in diameter, the cactus is about the size of a large chair, but rest assured, no matter how tired you are, you definitely don’t want to sit on it. If huge cannons, white dragons, and chair-sized cactuses aren’t enough to draw you in, there’s also a small amusement park, underground icehouse, numerous lovely pavilions, and a charming White Dragon restaurant. With all of these strange delights on offer, we’re sure you’ll find something in People’s Park that’ll make your day. Tomb Sweeping Festival: Sometimes referred to as Qingming Festival or Ancestor’s Day. It takes place on April 4th or 5th each year and is predominantly a day to pay respects to the deceased.